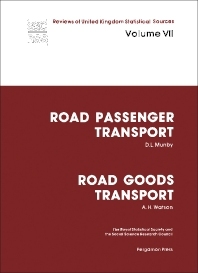 Road Passenger Transport: Road Goods Transport reviews sources of statistics on road passenger transport and the road transport of goods in Great Britain. Topics covered range from organization of passenger transport to main sources of data, along with regional statistics, modeling, and forecasts. Comprised of six chapters, this volume begins with an overview of inland transport on land in Great Britain, with the exception of railways. Varieties of passenger movement are considered, together with measurement of passenger transport. The discussion then turns to the organization of passenger transport, with emphasis on private movement and taxis as well as public road passenger transport. Main sources of statistics are presented, including the National Travel Survey; road censuses; vehicle registration and excise licensing; and annual reports of area licensing authorities. Data for pedestrians, bicycles, private cars, and motorcycles are also given. Examples of secondary analysis of available data are provided for purposes of modeling and forecasting. Papers on relevant theory, methodology, and statistical data requirements are also considered. This monograph will be of interest to both transport economists and environmentalists.